Happy birthday to Mickey Mouse, the iconic cartoon rodent and the official mascot of the Disney empire. Co-created by Walt Disney and Ub Iwerks, Mickey Mouse first appeared in screen tests for “Plane Crazy” on May 15, 1928. But his official debut in the animated short “Steamboat Willie” on November 18 of that same year catapulted Mickey into megastardom! Now he rules his (Magic) Kingdom, the entire (Disney) Land and the whole (Disney) World! We enjoy visiting Mickey Mouse and his friends at the theme parks in California and Florida. We are entertained with his Disney-Pixar-ABC-produced movies and TV shows. We shop for mouse ears and more merchandise for our family and friends’ children (and sometimes ourselves!) at the Disney Store in the malls. And we like to eat Mickey Mouse-shaped fun foods, like sandwiches, cookies, rice cereal-marshmallow treats and pops. Learn how to make Oreo sandwich cookies into magical chocolate-covered pops featuring his famous ears below. 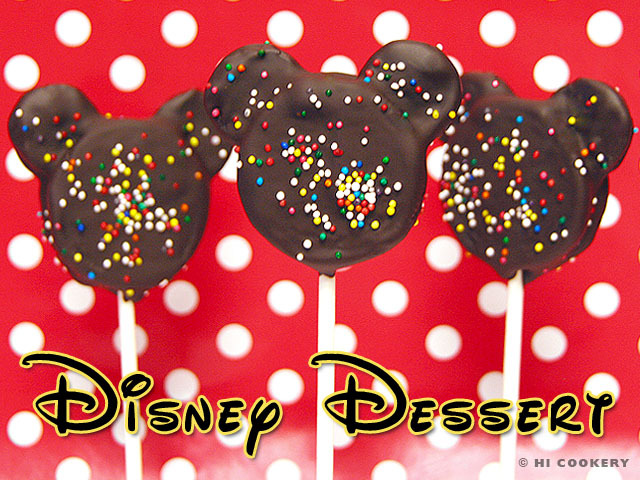 These delicious Disney-inspired desserts are great for serving at kids’ parties and for celebrating Mickey Mouse’s birthday! Twist and separate the mini Oreo cookies for the mouse ears. Scrape off the filling and set aside. Twist and separate the larger Oreo cookies for the face. Squeeze white tube frosting to act as an adhesive for the ears and lollipop sticks. Position two mini Oreo cookies and press in place a lollipop stick. Cover with the other half of the larger Oreo cookie, using additional white tube frosting as necessary. Push the other end of the lollipop stick into a styrofoam base. Continue assembling other cookie pops. Refrigerate until firm. Melt the chocolate and keep warm. Carefully coat the cookie pop with chocolate, gently tapping off the excess chocolate. Sprinkle with colorful non-pareils. Return to the styrofoam base and refrigerate until the chocolate has set. Serve as is or cover each cookie pop in a treat bag and tie with a decorative ribbon. The font we used on the final food photo above is called “Walt Disney Script” and can be downloaded free from Fonts 101. We recommend using at least a 6-inch lollipop stick as the weight of the cookie is heavy. 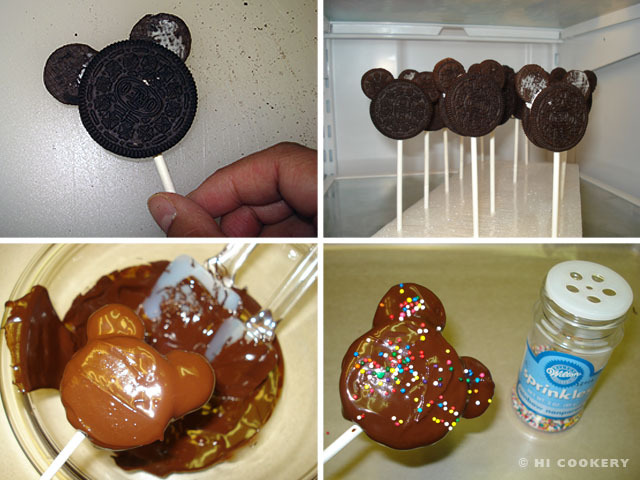 Instead of colorful non-pareils, try sprinkling the cookie pops with Mickey Mouse edible confetti. Read about Mickey Mouse at Time online magazine. For even more Mickey, go to the Disney website. Try our Oreo turkey cookies for a Thanksgiving treat. View our video on YouTube or see our regular blog post. Hi!! I’m stuck on the part of coating the pops in chocolate… I can’t seem to make the chocolate ‘thin’ enough to really get a good coating without losing the Mickey shape… Any suggestions? Thanks!! Hi, Jessica. If you’re using real chocolate, you can try thinning it with a little butter when you melt it. If you’re using candy melts (Wilton) or confectioner’s candy, you can try thinning with a little veggie shortening. Stir well and keep the chocolate warm and smooth so it coats better. Too thick and it’ll glob up fast. I just made some cake pops the other day and my candy melt coating was too thin! Fail on my part. You could try “painting” the chocolate on the Oreos, too, if they are too difficult to dip. Good luck with the Mickey Mouse pops! 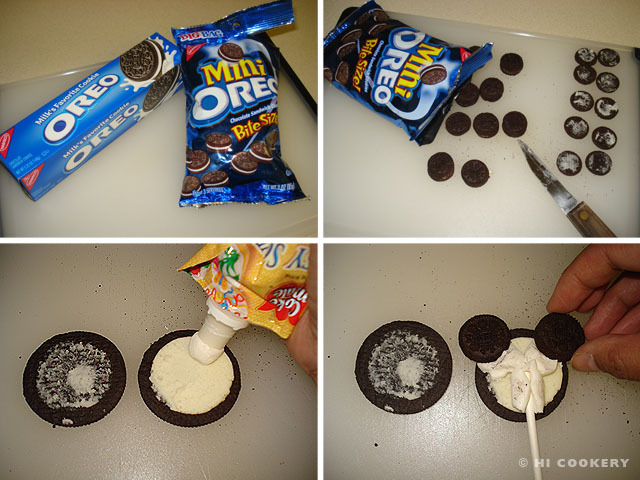 Cute idea, however…..took two packages of oreos to find enough whole ones to use. Found the steps tedious. Very messy taking them apart to glue them back together with frosting. Than never could get them to coat with the chocolate while on the stick. Ended up taking them off the stick and just kind of dipping them in the chocolate enough to stick the sprinkles. Messy, time consuming and expensive recipe. I would not make these again. Susan, sorry these did not work out for you. The trick is to make sure the shaped cookies (head+ears) are very cold or even frozen before dipping them in the chocolate or they will fall apart. We used a rubber spatula to help us dip/coat/paint on the chocolate. Our post has been adapted from other blog recipes that worked. It does take some practice to get the technique down.